The judge investigating Iranian involvement in the 1994 bombing of the Jewish Community Center in Buenos Aires has ordered the seizure of all evidence in light of Sunday night's apparent murder of prosecutor Alberto Nisman. Local newspaper Perfil reported that [Judge Ariel] Lijo ordered the seizure of all documentation referred to in the complaint, as well as a number of disks reportedly containing recordings of wiretaps that were provided to Nisman, and which allegedly include direct communications between Iranian and Argentine officials over the investigation into the AMIA bombing, which Nisman assumed responsibility for in 2006. 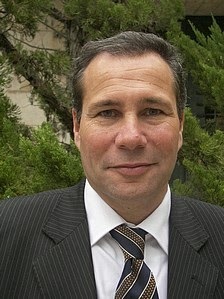 Lijo’s announcement came as the initial findings of the autopsy into Nisman’s death were released. According to La Nacion, the bullet which took Nisman’s life entered through his temple. Viviana Fein, who is in charge of the investigation into Nisman’s death, also said that there was no evidence to indicate that the door to Nisman’s residence had been forced open. In addition to his complaint, Nisman had ordered the freezing of assets worth some $23 million belonging to Fernández de Kirchner, Foreign Minister Héctor Timerman, and other officials. These and similar details have led to a flurry of speculation among Argentinian politicians and journalists that foul play was involved in his death. Elisa Carrio, leader of the Civic Coalition, an opposition party, bluntly called Nisman’s death “an assassination,” saying she did not accept that it was a suicide. Meanwhile, the Argentine government has announced that Alberto Adrián Gentili will replace Nisman at the head of the AMIA bombing investigation. Gentili, who is regarded as close to the government, was removed from a 2008 investigation into narcotics trafficking after authorizing intelligence activities against individuals with no prior record of involvement in the drugs trade. In 2012, he was reinstated as a Prosecutor by Alejandra Gils Carbo, Argentina’s Prosecutor-General.